Join Hopeful Hounds, Inc, for the the 8th Annual Dog Gone Cold 5k run/walk on January 26, 2019 at the Julian Smith BBQ Pit (3 Milledge Road) in Augusta, GA. The 1-Mile Fun Run will begin at 9:30a.m. and the 5k will begin at 10:00a.m. All runners and walkers are encouraged to participate in the 5k and bring their canine companions! Course is USATF Certified! THIS EVENT WILL BE HELD RAIN OR SHINE! Dog Gone Cold 5k Run/Walk: All runners and walkers are encouraged to participate in the 5k and bring their canine companions! Dog Gone Cold 5k Entry Fee: The Dog Gone Cold 5K entry fee is $25 through January 19 and $30 after January 19 with a t-shirt. The entry fee will be $20 through January 19 and $25 after January 19 without a t-shirt. 5k T-Shirts: Event t-shirts will be available to participants who register for the t-shirt option by January 11. T-shirts are not guaranteed to participants who register after January 11!!! Extras will be ordered but they will be given out on a first come, first serve basis. Youth sizes S, M, and L and Adult sizes S, M, L, XL and XXL ($5 extra) will be available. 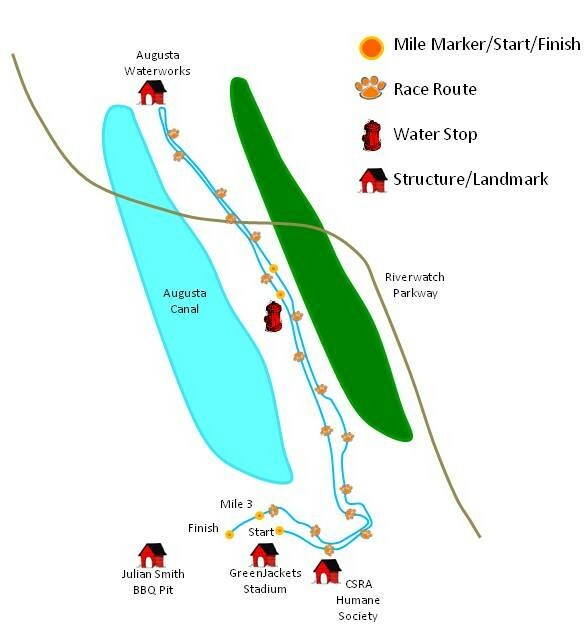 5k Course: The run will start in front of the GreenJackets stadium and will continue down in front of the CSRA Humane Society onto the Augusta Canal, loop back at the Augusta Waterworks and finish in front of the Julian Smith BBQ Pit on Lake Olmstead. The Dog Gone Cold 5K Course is USATF CERTIFIED!!! It is USATF Course Certification #GA12083WC. 5k Timing: Electronic timing for the 5k will be provided by Strictly Running. Walkers/Strollers: Walkers are encouraged to participate in the Dog Gone Cold 5k! Strollers are allowed on the Dog Gone Cold 5k Course. Dogs: Dogs are welcome in the Dog Gone Cold 5k but please be courteous of fellow runners without dogs! All dogs MUST be leashed, well socialized and up to date on all vaccinations. Dog Gone Cold 1-Mile Fun Run: The Dog Gone Cold 1-Mile Fun Run will begin at 9:30a.m. on January 26, 2018, and is open to all ages. 1-Mile Fun Run Course: The 1-Mile Fun Run starts in front of the Julian Smith BBQ Pit and follows Milledge Road and turns left onto the path to follow Lake Olmstead to come up behind the Julian Smith BBQ Pit. 1-Mile Fun Run Fee and T-Shirts: The non-refundable entry fee for the 1-Mile Fun Run is $15 with a t-shirt and $10 without a t-shirt. Event t-shirts will be available to participants who register for the t-shirt option by January 11. T-shirts are not guaranteed to participants who register after January 11!!! Extras will be ordered but they will be given out on a first come, first serve basis. Youth sizes S, M, and L and Adult sizes S, M, L, XL, XXL ($5 extra) will be available. More activities from Hopeful Hounds, Inc.